At only 2,5 kilometers distance from Dubrovnik Old Town, you will discover the holiday paradise you were dreaming of. 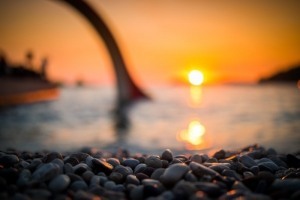 With a perfect setting in Uvala Lapad bay, featuring the largest beach in Dubrovnik, our modern and newly built beach resort Sunset Beach Dubrovnik is among the most appealing places in Dubrovnik, for both tourist and local people. Sunset Beach Dubrovnik is an attractive beach destination for couples, as well as for groups of friends, business people and families. It offers a great variety of services and amenities essential for fully relaxing and unforgettably fun holiday. Our facilities are designed to offer a high level of comfort, and our attentive staff is there to accommodate any wish you might have. The beach is equipped with more than 400 sunbeds and 15 cabanas, waiting for you to lay down and forget all your worries while getting a nice tan, having a cool drink and a tasty snack. Our Lounge Club & Dining area is perfect for casual dining, daytime leasure, summer night's dinner out in the open air, as well as for lounging and clubbing in good company. Here, you will be served with our finest food, drinks and cocktail selection in an utterly relaxing ambiance. À la carte Restaurant Kantenari, along with the great food and wine selection, offers you a view of the reefs and sailing boats at a distance, and a stunning view of the magnificent sunset. If you get hungry, and feel the need for a delicious snack, the authentic flavours of tasty specialties in our Trattoria will surely satiate your hunger. The tomato sauce on our famous pizza is homemade, as well as our cakes and sweets. So, if you have a sweet tooth, you must try something from our pastry shop! Sunset beach bar is the ideal place for having a casual coffee, colorful cocktail, cold refreshing beer or soft drinks. Our polite and skilled staff is always there to attend your needs. A great addition to our beach resort is a green park area with mediterranean plants and several decades old olive trees. Sunset Beach Dubrovnik also features sport facilities, playground, exchange office and travel agency, thus covering all guests' needs. Also, free high speed Wi-Fi with excellent signal strength is available throughout the whole resort.